Aeschynanthus (unknown) Thailand sp. 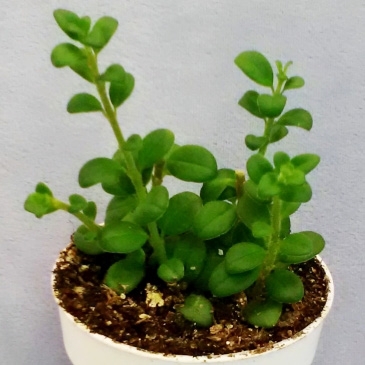 This adorable, tiny growing aeschynanthus species we acquired at a gesneriad show. It is an unknown (or as yet unnamed) species from Thailand. Very tiny, soft, bright green leaves on upright tender green stems. We have yet to see it bloom, but it grows wonderfully as a small container or terrarium specimen. This is a very cute little terrarium plant that doesn't need much to look good. It stands straight up and doesn't droop. I liked it so much that I ordered a second pair. It hasn't bloomed, as stated above, but it looks good in both jars and dish gardens.